Posted 20 August 2014 under Ask Us. Whether you have a fast metabolism or a naturally slender frame, gaining weight in a healthy way can require the same hard work and diligence as losing weight in a healthy way. Having a high metabolism means your body burns energy from food at a faster rate than your peers (friends/family members or others your age). This means that we require more energy from food in order to grow and develop. However, having a naturally fast metabolism doesn’t mean it’s healthy to run to the vending machine and snack bar at every opportunity. It’ still important to eat plenty of healthy, well balanced foods: eating at least 3 meals a day, plus nutritious snacks in between to boost your overall energy intake. It may help to bump up those portion sizes as well! Since each food group includes different nutrients it is important to include all food groups (carbohydrates, fats, proteins) during each meal and snack. By including healthy balanced meals and snacks, your body will be able to stay energized to grow strong and gain the appropriate weight. In order to provide your body with enough energy, we recommend “nutrient-dense” foods. Nutrient dense foods provide the body with a lot of energy as well as vitamins and minerals. 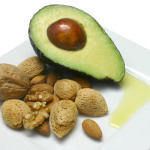 Think – avocado, nuts, seeds, peanut butter! These foods provide your body with plenty of energy but within a relatively small, regular portion size. For more ideas, check out our Healthy Snack page or read here about quick easy tips to boost energy and calories of snacks and meals! Other ideas to help with healthy weight gain include making a grocery list before you go shopping and then buying ingredients that you can use to prepare meals at home and on-the-go ahead of time. This way you can pack your food to prevent any unexpected meal skipping. Another idea to get strong and build muscle to your frame is to use free weights and do weight resistance exercise. However, be sure to speak with your health care provider (HCP) before starting a new exercise routine.